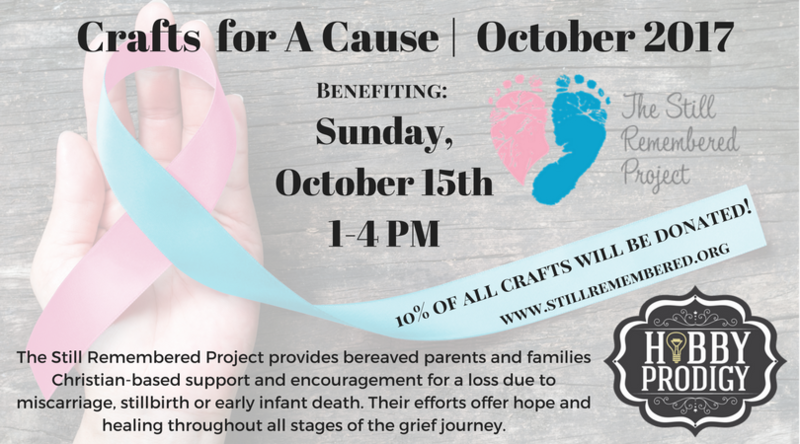 Pittsburgh, PA- Family-owned Pittsburgh craft studio, Hobby Prodigy announced that they have collaborated with The Still Remembered Project for the month of October. The Still Remembered Project is to host an event with Hobby Prodigy’s – Crafts for A Cause program. This event will be held at Hobby Prodigy on Sunday October 15th from 1:00-4:00pm at The Mall at Robinson, 100 Robinson Center Drive, Pittsburgh PA, 15205. The Still Remembered Project provides bereaved parents and families Christian-based support and encouragement for a loss due to miscarriage, stillbirth, or early infant death. Their efforts offer hope and healing throughout all stages of the grief journey. Hobby Prodigy’s goal is to give back to the community one craft at a time. Hobby Prodigy expects to raise funds to help The Still Remembered Project’s goals, raise awareness and give guests an insight on all that The Still Remembered Project offers. Hobby Prodigy achieves this goal by educating Hobby Prodigy customers about The Still Remembered Project before placing their craft order, giving customers content to share, donating 10% of all “String Art” projects crafted in the month of October, and posting information on the HP website. Customers also have the option of donating any amount to the non-profit at check out. The day of The Still Remembered Project’s event, 10% of ALL projects crafted will be donated to the non-profit. Hobby Prodigy is a craft studio that focuses on giving back to the community as well as allowing people to channel into their inner genius. Hobby Prodigy offers a true Do-It-Yourself experience by providing a variety of different crafts in which you can choose from as well as allowing you to do so in a fun and safe environment.